A gyroscope that is suspended in just one gimbal whose bearings form its output axis and which is restrained by a spring; rotation of the gyroscope frame about an axis perpendicular to both spin and output axes produces precession of the gimbal within the bearings proportional to the rate of rotation. a gyroscopic device used in finding the angular velocity of an object on which it is mounted. The most widely used type of rate gyroscope uses an astatic restrained gyroscope. In such a rate gyroscope (see Figure 1) the rotor of the gyroscope is mounted in the gimbal ring (frame). Rotation of the frame is limited by a spring, which creates a restoring moment. The natural oscillations of the gyroscope are extinguished by the damper. Figure 1. Diagram of a rate gyroscope: Oξηζ are axes of the reference system; Oxyz are axes of the gimbal ring. If the object is rotated around the axis Oζ (the input axis) with an angular velocity ωζ, the frame will rotate around the axis Oη (the output axis) to an angle β. The dependence of this angle on ωζ is given by the equation β = ωζH/c, where H is the moment of momentum of the gyroscope and c is a coefficient that depends on the stiffness of the spring and on the location of the point where the spring is attached. The values of β are read from the potentiometer; they define the magnitude of ωζ. The sensitivity threshold of a rate gyroscope, in terms of angular velocity of an object, is on the order of tenths of a degree per second. Some other types of rate gyroscopes, which use a floating suspension, are even more accurate. Rate gyroscopes are used in aircraft as turn indicators and sensing elements in automatic stabilization systems and on ships in roll-and-pitch dampers and other systems. They may also be used in inertial navigation systems. Devices that simultaneously determine both the angular velocity and the angular acceleration of an object also exist. Such devices are called rate gyroscope-accelerometers; they utilize an astatic gyroscope with three degrees of freedom. Devices of this type are used, for example, in aircraft autopilots. The MEMS gyroscopes, an alternative to the conventional rate gyroscope based on a high speed rotor supported in gimbals, can be used to measure the spacecraft angular rate with respect to an inertial reference frame [1, 2]. Compared with the conventional rate gyroscope, the electromechanical asymmetrical error of scale factor of DG MEMS gyroscope is significant. 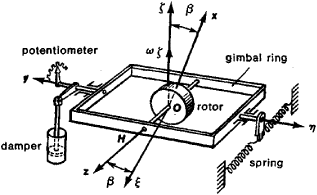 The basic operating element of a MEMS rate gyroscope is a flexing piezoelelectric beam coupled to a sensing element. in 1951, it designed a subminiature rate gyroscope that Timex eventually made and marketed. developed and implemented a method that more quickly and economically repairs the stabilator amplifier's pitch rate gyroscope. With the new process, ASE Division technicians send the stab amp's pitch rate gyroscope to their counterparts in the Air Communications/ Instrument Division for testing. Systron Donner has developed a piezoelectric quartz rate gyroscope that has tuning forks as drive and pickup units. The ADXRS450 iMEMS gyroscope is a complete angular rate gyroscope in a single package and is the first device in a new class of high performance MEMS gyros from ADI that feature an innovative differential quad-sensor design. includes three orthogonal rate gyroscopes, three orthogonal accelerometers, a microprocessor, data logger, and RF transceiver. Positional control of the telescope comes by way of rate gyroscopes for rough fixes, star trackers for tighter orientation, and interferometric fine guidance systems for finding and tracking, nebulae, white dwarfs, and other interstellar objects.